Forget the traditional arch, these days, anything can become a beautiful backdrop to your wedding ceremony. 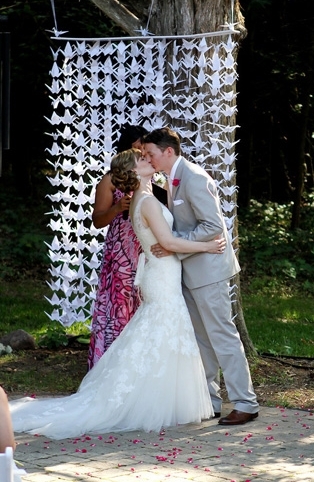 Old barn doors, colorful streamers and DIY cranes are all ways to dress up your "I dos." If you're looking for a creative decor idea, browse 10 stylish backdrop options below. Are you an origami enthusiast? Put your skills to work and DIY a one-of-kind backdrop. This sparkly backdrop screams fun and glamour! Use lights to create a whimsical wedding background. Having a destination wedding? A colorful umbrella backdrop perfectly sets the tone. Set the stage for a romantic affair with lush linen curtains. You just know this couple is super fun. This backdrop was inspired by Disney's "Up"! A quilted backdrop is great for a rustic wedding. Old barn doors are the perfect complement to a farm wedding. Add a chandelier to your wedding altar for a vintage-chic look.